About a hundred students gathered to protest for free education at Square Victoria park downtown this Wednesday. The protest was organized by Dans la Rue Montreal, in support of the Canadian Federation of of Students who organized protests pushing for free education all around Canada in 42 other campuses and in 28 different cities, on the same day. The Canadian Federation of Students does not have a chapter in Quebec, but that didn’t stop Montreal students from coming out and showing solidarity with the movement. He is hoping the provincial and federal government will hear out the demands of Dans la Rue and the Canadian Federation of Students. Forcione argued that the Canadian government has enough money to create free education, and that free education could easily become possible as long as the government stop prioritizing military spending and instead reallocated that money into funding education. The national average debt of students standing is at almost $27,000 since 2015. Protesters there with Campagne sur le Travail Étudiant UQAM also expressed their discontent with unpaid internships, which are becoming the new norm for students in Quebec and all around Canada. They highlighted that the majority of students are currently trapped in a system where in order to get ahead in their career they must take on unpaid internships. Unpaid internships don’t allow students to make a living wage, or to easily pay back their student loans. “Students need to be recognized as professionals, and not only as students,” said Valérie Simard, member of CUTE UQAM. She hopes more students working unpaid internships get inspired by this, and that they decide to go on strike as well. Her movement also focuses on the hardships that are faced by parents who have to balance raising their children, doing their studies, and working their internships. “If we look at unpaid internships, we see that’s it’s mainly in domains where most of the workers are women,” said Simard. As a result many female students are lacking financial autonomy and are forced to rely on their spouse or parents in order to get by. 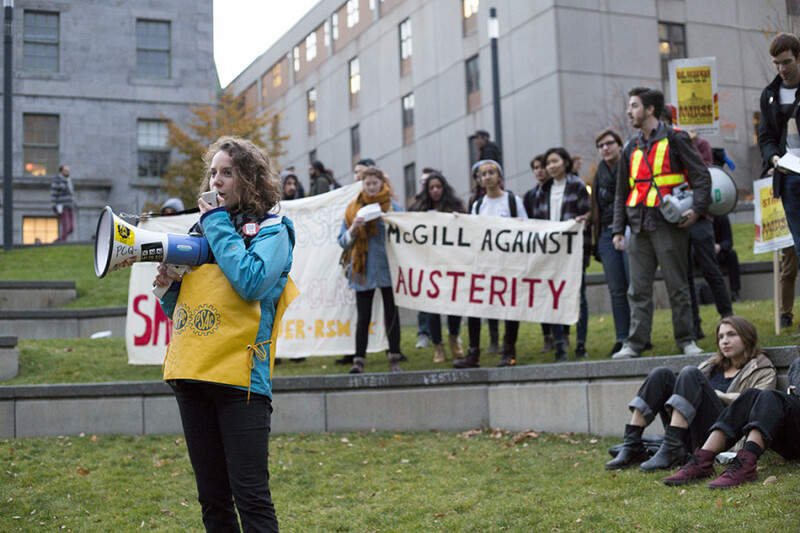 The protest, which started west on Saint-Antoine St., ended at McGill University, near the corner of Milton and University. 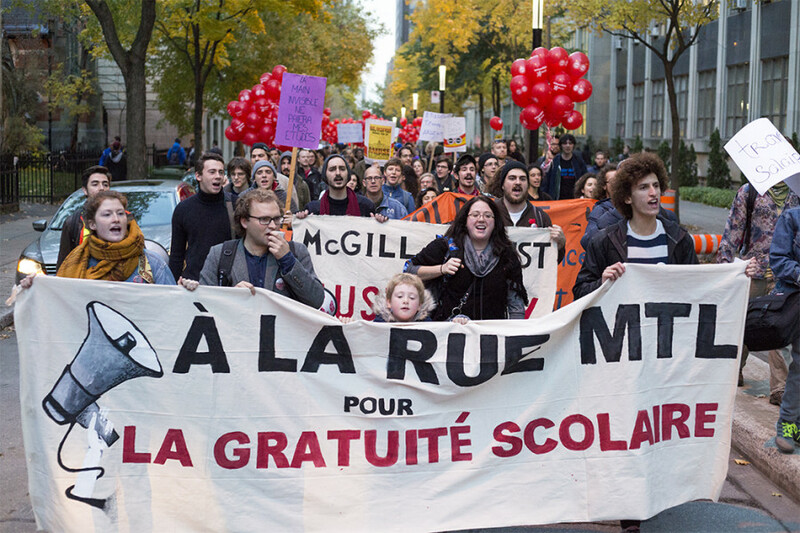 Dans la Rue chose to end the protest there in order to show their support for the Association of Mcgill University Support Employees who were striking there that night. They have been on strike since Oct. 29, and are fighting for higher wages, paid sick leave, and a fairer collective agreement.